a coal mining camp historical site. 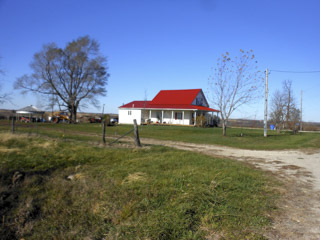 it was renovated by the current owners, Lisa and Mark Keeton. The photo is looking northwest from the K road (650th Avenue). The “Charley Bloom Home” was and still is in the famous Buxton, Iowa coal mining camp, or more specifically in the East Swede Town section of Buxton. It remains one of the last two homes of the nearly 1,000 homes that existed in what was Buxton, a coal mining camp that once swept across northern Monroe County, Iowa over a century ago. The other home is what was originally the Johnny Thomas home, that is now the vacant home of Art Carlson home who died in 2012. 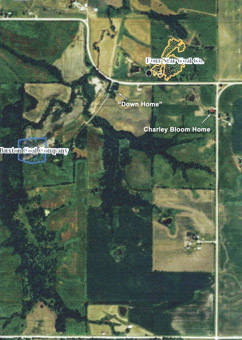 Art Carlson’s home is located on what was the northwest entrance to Buxton (B Street/102nd Avenue) from the Monroe/Mahaska County Line road( 340th Street). The “Charley Bloom Home” can be easily identified on satellite maps due to it’s red roof. The Bloom home is located on the west side of the K road(650th Ave.) near where it intersects with the County Line road (340th St.). Buxton’s East Swede Town in 1909. The Charley Bloom home now stands alone on top of a hill as if it is guarding the valley below that once was the downtown of the Buxton coal mining camp. I call that area, Buxton Park. The Park area has now been leased to the Monroe County Historical Museum by the Kreegel family who own the land that encompasses Buxton Park. 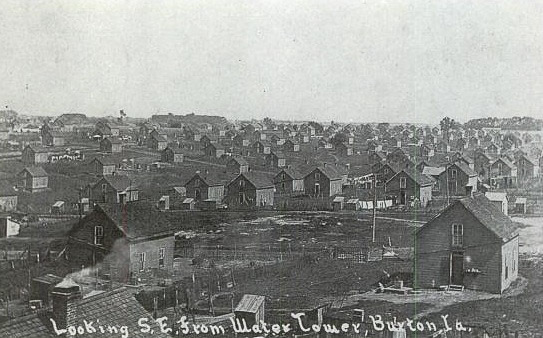 Buxton, in the early 20th century, was home to over 5,000 miners and their families. The Buxton coal fields (Consolidation Coal Company’s mines 10-17) were the largest in Iowa and one of the largest in the country. 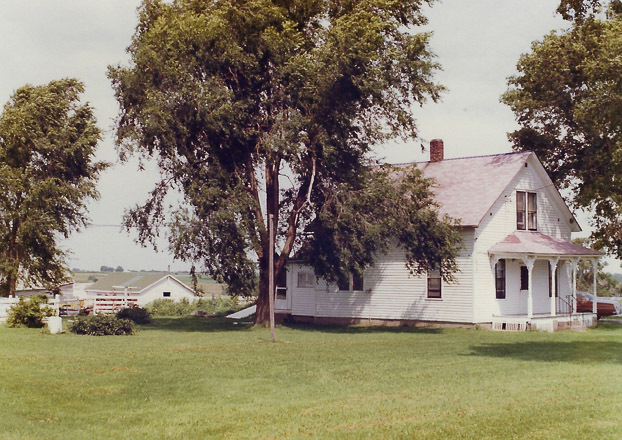 The home has remained in the exact same location as when it was built by the Bloom family in 1901 after the coal company closed the Muchakinock coal fields near Oskaloosa (CCC mines 1-9) and moved to the Buxton coal fields(CCC mines 10-17). The house is now the home of Lisa and Mark Keeton. Lisa is a fifth generation member of the Larson family that has lived and farmed in the Buxton area since it was developed from hay fields in the early 1900s. Lisa is the daughter of Dave and Liz Larson who still live on a farm just east of Lisa and Mark. The home, like all of the homes in East Swede Town, had an unusual arrangement to it, since the home was built and owned by Charley Bloom, but the land it was located on was owned by the Consolidation Coal Company (CCC). This arrangement was characteristic of the Swedish immigrant homes in Buxton’s East Swede Town. This area of approximately 40 acres was in the very northeast corner of the one square mile of land owned by the CCC. 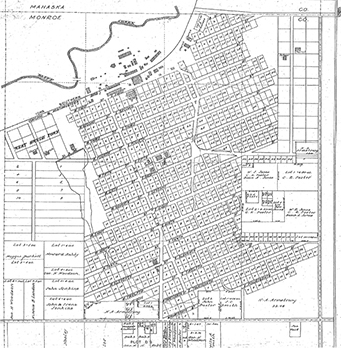 The 1919 plat map of Buxton shows the East Swede Town area with the large one acre lots. The Charley Bloom home was on the lot just to the east of where the church lot is identified in East Swede Town on the plat map. My Swedish great grandfather, Adolph Fredrick Nylander, was one of the individuals that negotiated the land / lease arrangement with the mine superintendent, Ben Buxton. The rent on the one acre of land was less than $1.00 per month. Some literature even shows the rent at 50 cents. Rent for the CCC owned homes was in the $5.00 to $7.00 per month range. The CCC also provided health insurance to the miners and their family for around $1.00 per month. The houses in East Swede Town were generally bigger and more stylish than the company-owned houses. The East Swede Town houses sat on one acre lots, as compared to the quarter acre sized lots for the company owned homes. The Swedes used the one acre to grow large gardens. The canning of food items from their gardens was a major annual event for the women in East Swede Town. Since the homes had no basements, it was necessary to dig underground cellars (caves) near the homes for the storing of the food items from their gardens that had been preserved with the canning process in glass jars. The tornado shelters that are now build in states where homes are built without basements are remindful of the cellars (caves) build for food storage in the coal mining camp homes. acre in size. Buxton proper was roughy one square mile in size. Coal Company for their miners families. The estimate of 1,000 miner family homes existing in Buxton is quite reasonable when one counts how many 1/4 acre plats of land exist on the 680 acres in the one square mile of land the CCC owned. The 1915 census of that period confirms a total population of well over 5,000 inhabitants, rather than the 9,000 to 10,000 often quoted. The census designates between black and whites, and shows that blacks outnumbered whites by a small amount, but not to the 90% extent often quoted about Buxton. When the CCC moved its coal mining operation to the Consol coal fields from the Buxton coal fields between 1915 and 1920, the population dynamics changed to black miners becoming less than 1/3 of the inhabitants. The total population of Bucknell, Haydock and Consol in the 1920’s was in the 3,000 range at this time. That said, most black miners remained living in Buxton and commuted by company trains to the Consol coal mines located 20 miles to the southwest of Buxton. 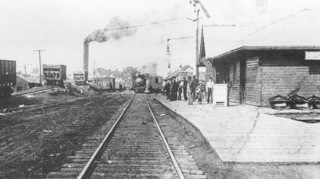 After the CCC, changed it’s name and ownership to the the “Superior Coal Company” in 1924, it discontinued the passenger service for miners between Buxton and Bucknell. Then in 1927 the company closed all of its remaining mines (18,19 and the sunk but not yet opened 20 mine) and moved its coal mining operation to the Gillespie, Illinois area, 40 miles north of St. Louis. from the K road (650th Avenue). 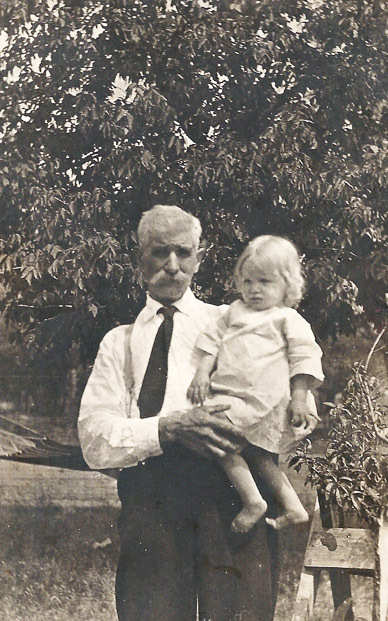 Unfortunately, since the coal company owned all of the land known as Buxton, where the families actually lived in Buxton is not readily identifiable in Monroe County records. Instead, one needs to rummage through the annuls of the period to get an idea of where families actually lived in the area. The census of the 1920’s does indicate that the company mixed black and white families in rental houses with apparently no regard to the color of their skin. The CCC was very autocratic in managing the rental homes that the miners and their families rented from them. As example, if you or a member of your family created a disturbance in Buxton proper (the area owned by CCC), you most likely would be asked to leave Buxton and you would lose your job at the mine as well. No saloons existed in the the area of Buxton owned by the coal company.The sale of liquor, in the land owned by the coal company i.e. Buxton proper, was limited to drug stores. With the knowledge of how the CCC managed the rental properties in Buxton, it is understandable how so much information and history no longer exists. Unfortunately the opposite does exist, since there is a wealth of mis-information that has been distributed and written. 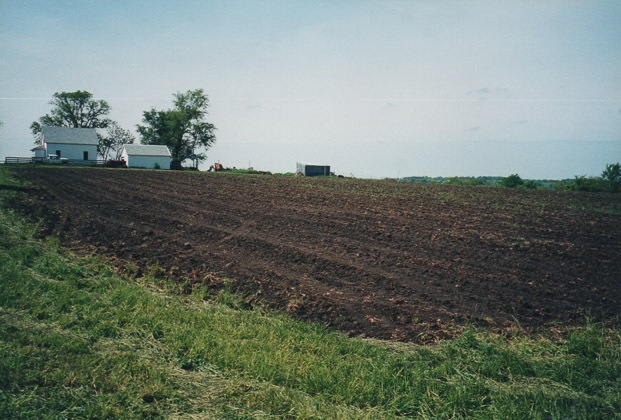 A prime example is in my story called “Where’s Haydock,” in which I write that the author of books on Buxton( Ames; Iowa State University Press 1987), Iowa State professor Dorothy Schwieder, gave up, by her own admission, on determining where Haydock was as compared to Bucknell and labeled all of the area, including were Bucknell was located, as Haydock. This was unfortunate, since her writings have “Haydock” existing before there was a Haydock. By doing so in her book, Bucknell basically disappears from her account of history with no historical significance.Since the coal camps were not incorporated, the confusion is warranted. In spite of the inaccuracies in her book on Buxton, Professor Schwieder’s books are appreciated by me. She died 2-3 years ago in Ames, Iowa. 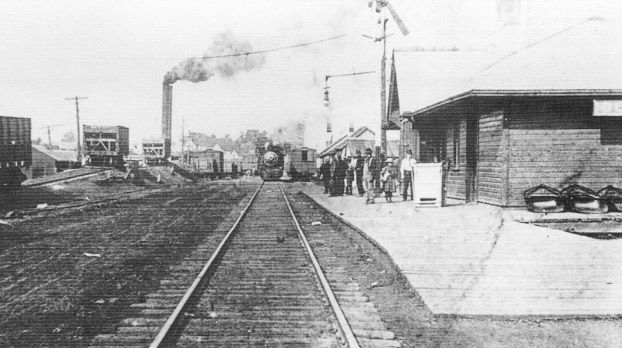 Buxton, Iowa train depot looking north 1908. The Bloom house that was my grandparent’s home from 1947 to 1958 became a favorite place for me to spend summers away from my hometown in Charles City. It was in those summers as a youngster that I spent at my grandparents’ home, the Bloom house, that I gained my love of the lore of Monroe County’s coal mining era. While I never lived in the area, I remember those summers of walking “hand in hand” with my grandmother Emma (Nylander) Peterson down a deserted path that once was Buxton’s main street(102nd Ave.), wading in a stream, or running in the corn fields that were once full of miners’ homes. I would peer down in to wells as I lay on the rotten planks of wood covering the wells. Luck was with my sister and me that we didn’t fall into the wells and drown. Bernie, Mother Emma,Wilma and Linnea. Ivan is kneeling. Son Irving and Daughter Ruth Pauline were deceased. The former home of the Linus Larson family is in the background. I worshiped in the Ebenezer Lutheran Church that once was initially located in Muchakinock between Oskaloosa and Eddyville before my great grandfather, Adolph Nylander, helped move the church to Buxton. The 8’x10’ painting of “Christ at Gethsemane” by world famous artist Birger Sandzen adorned the wall behind the altar, but all was lost when the church and the painting burned to the ground in December 1953. 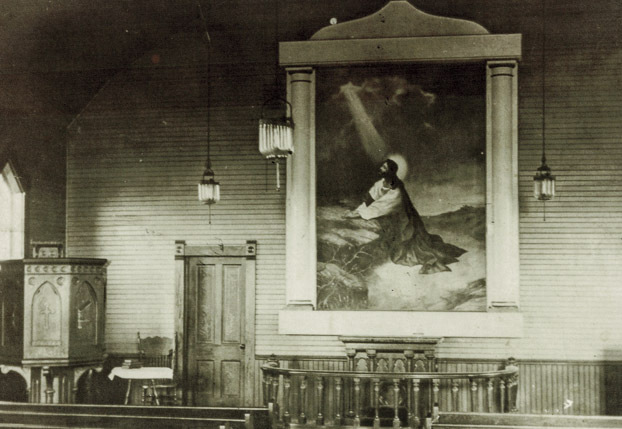 According to Dave Larson, the church including the Sandzen painting was insured for $2,500 dollars. Sandzen painting are now selling for upwards of one million dollars! 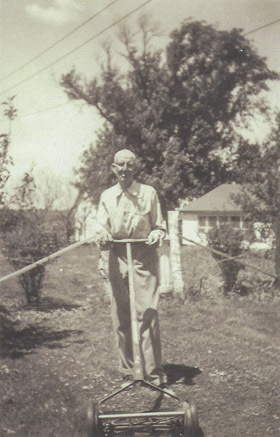 in the background in this 1950 photo. Fortunately, the altar from the church was saved from the fire and is now located in the St. Paul Lutheran Church in Albia.Thousands of Swedish immigrants were baptized and confirmed at that altar. With so many of our roots faded from history, it is that altar at the church that brings back to me memories of my family’s ancestors. in the picture that is now owned by Mark and Lisa Keeton. The church sat directly behind the Bloom home. 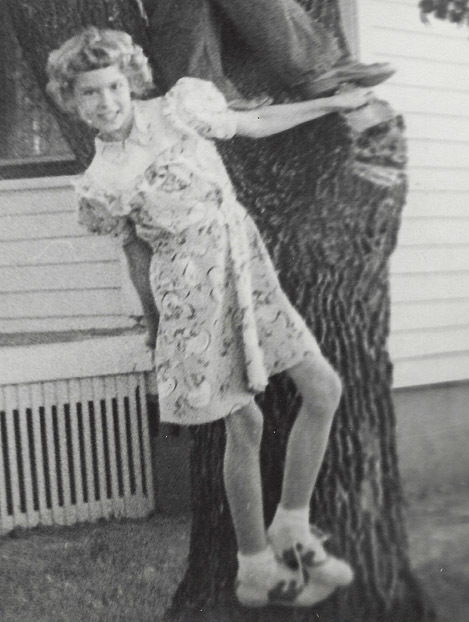 For the Peterson family to attend church, we would walk out the back door of the house, under the pear tree, through the chicken farm yard, near the corn bin, past the tree where I built a tree house, and up the front steps of the church that faced to the west. What was once Buxton laid out below us in a mystical manner. Since the church was perched on one of the highest locations in the area, I am sure my great grandfather Adolph Nylander and his associates picked that location with that view in mind. The 1919 Monroe County Plat Map shows the road(path) that passed in front of the west facing church. A number of Peterson/Nylander families also lived along the path. The path became a corn field after the mines were closed. is located 2 mileseast of Buxton on 340th Street. One can imagine viewing a large locomotive coal train passing through the valley below the church, as well as smoke billowing from a 230 foot smoke stack. One could also image the steam engines for generating and providing electric service to the company’s buildings, including the company store. Very few miner’s homes had electrical service and if they did, it was DC(Direct Current). There still is a Buxton, after 100 years, for those of us who have gained an appreciation of its lore. in a dress with bobby socks and saddle shoes. 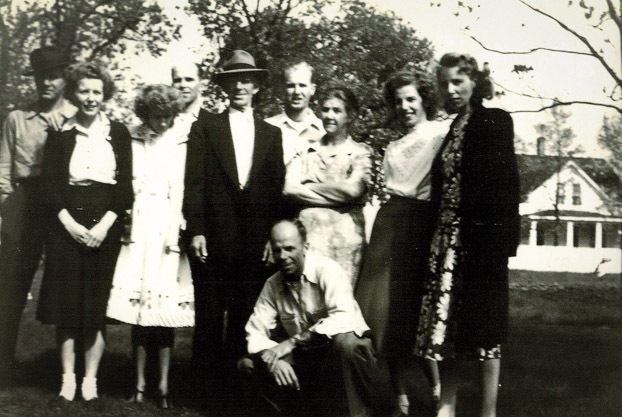 After the church service our family would return to the Bloom home, being certain to stop at the fruit cellar behind the home for items for Sunday dinner. Sunday dinner was the largest dinner of the week. Egg dishes were quite common, using eggs directly from the chicken coop. Fetching eggs from the coop with my grandmother was always fun, especially if a hen didn’t appreciate us stealing her eggs. The coop was built by my grandparents’ youngest son Roy, who had just returned from service on Guam in the Pacific Ocean. Roy’s chicken coop had a sway in the roof due to some mis-measurements on his part. Years later, after my grandparents had died and Manny, Loren, and Mabel Blomgren lived in the home, I stopped to visit them. Loren asked me about the sway in the roof of the chicken coop since he had been trying to straighten it out. I had to tell Loren that it might be difficult since Roy actually built the chicken coop with the sway. Keeton purchased the home in the early 2000’s. The feature of Sunday’s meal was grandmother’s freshly baked rye bread and fried chicken with the chicken coming directly from grandma’s chicken lot. As I remember, grandma prepared the food on a large wood burning stove. They had heating oil for heating the house. Grandma’s youngest brother, Henry, was a cook in the army during WWI. Whenever he was at Grandma and Grandpa’s when I was there, I knew we would enjoy some of his cooking. After the war Henry had restaurants with John Watson in Chariton, Albia, and Ottumwa. He later cooked for the VA in Des Moines. The Peterson/Nylander family get togethers at the Bloom House were big events with upwards of 40 in attendance. Grandma’s sister Tekla (Nylander) and her husband Richard Olson lived a short distance south on the K Road(650th Ave). where sleeping accommodations were provided for many of us. The upstairs in the Bloom home was spacious and filled with dorm style sleeping. If weather cooperated, the large yard was a bevy of activity. My favorite activity was playing catch with a former player from the Buxton Wonder baseball team, Hjalmer Nylander, my grandmother’s brother. I enjoyed climbing the trees around the property, including the one in the back near the corn crib where I built a tree house.The trees most likely had been planted over a half century prior by the Bloom’s. Dave and Emma Peterson in 1948 photo with their grandchildren. were Ray and Iva Peterson. 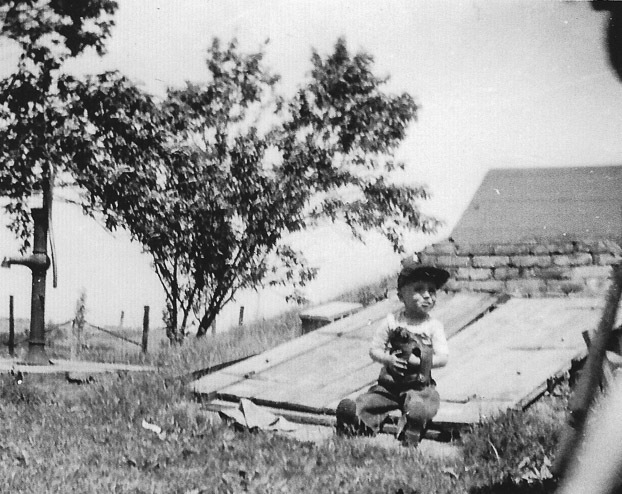 The fruit cellar (cave) was behind the house and was used for storing my grandmother’s canned vegetables and fruits. The floor flooded with water frequently so grandpa had to regularly pumped the water out. 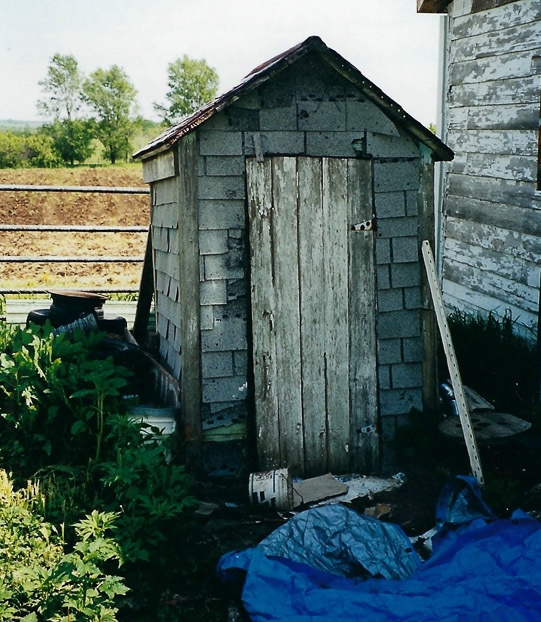 A cistern for capturing rain run-off from the house’s roof for baths and washing clothes was next to the steps to the back entrance to the house’s enclosed back porch. The pump for drinking and cooking water was farther from the house to the west. 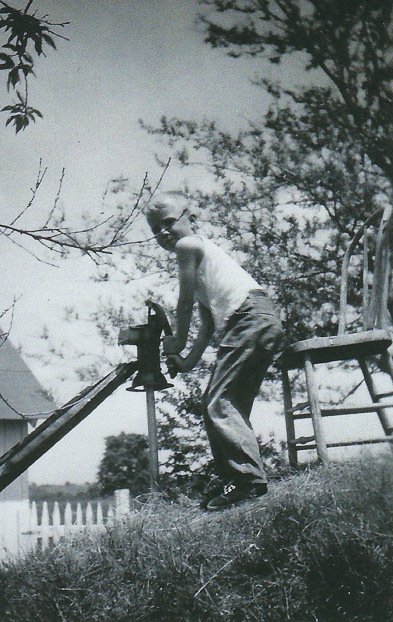 In the late 1940s a drought in southern Iowa made it necessary to get water from the neighbor Linus Larson’s well. Grandpa, although crippled from a mining accident when slate fell on him, mowed the rather large yard with a rotary styled mower that he pushed by hand. He used a “ Grim Reaper” style scythe to trim weeds. After my grandparents moved in to the Bloom home in 1947, they also farmed the nearly 20 acres that adjoined the house. 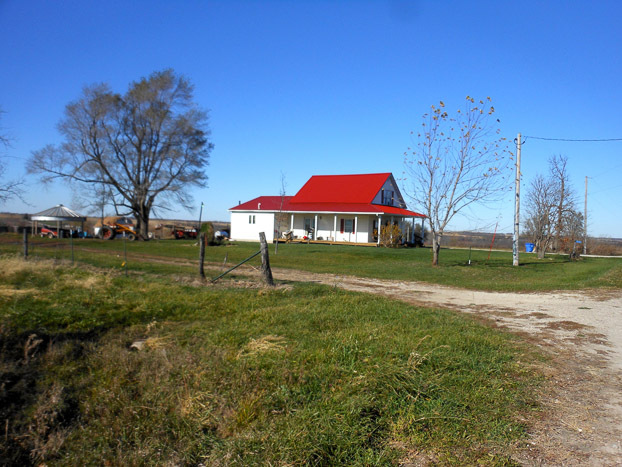 My grandfather converted the former Carlson homestead in to a pig lot. The lot was at the southwest corner of where the K road and the Monroe Mahaska county line road intersection. 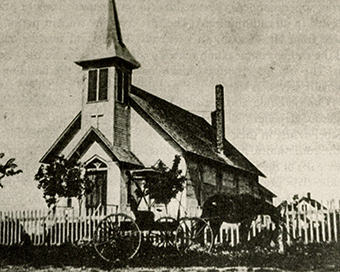 The well on the former Carlson homestead was still functional at that time. At my age then, the pig sows seemed as large as me. Dave Larson of rural Albia tells the story of his Dad, Lenard, hauling pigs to market for my grandfather. Dave and Liz Larson are still farming much of the land that formerly was Buxton that has been in the Larson family for over 100 years. Dave and Liz’s daughter Lisa and her husband, Mark Keeton, and family now live in the Bloom house. The Bloom family built the home in the early 1900s after the CCC moved it’s coal mining operation from the Muchakinock Coal Fields to the Buxton Coal Fields. The Blooms purchased the land that the house was sitting on after the mines closed and CCC/SCD left Iowa to go to Illinois in the late 1920s. It remained in the Bloom family until after WWII when my grandparents purchased the house, including 15 acres of farm land. My grandparents purchased the home for $1,200 in 1947 after they returned from working in the shipyards in Richmond (Oakland) California during WWII. The Blomgren’s (Manny, the dad, daughter Mabel, and son Loren) purchased the home after my grandparents died in the late 1950s. 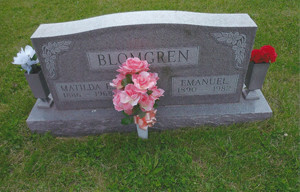 The Manny Blomgren family lived in the home for nearly 40 years. 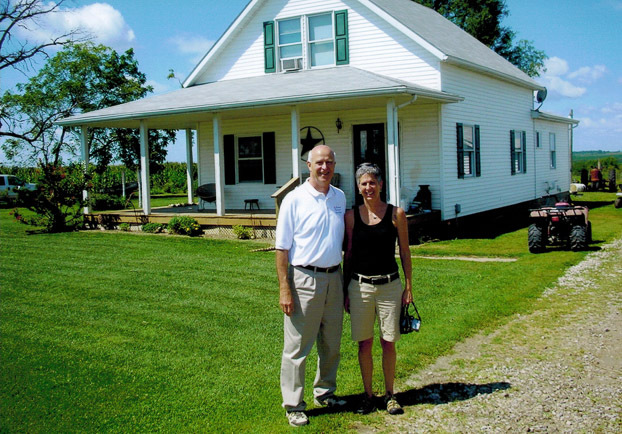 After Manny, Loren and Mabel had died, Mark and Lisa Keaton purchased the home. Manny was a “Pit” boss at mine 18 in Bucknell in the Consol Coal Fields. Mine 18 was, at the time, one of the largest coal producing coal mine in the nation with upwards of 4,000 tons per day. and I assume Donny Esperson is the tot in the photo. The water pump can be seen in the photo. 1940's photo. 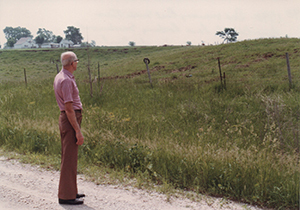 I had occasion over ten years ago to give the Albia newspaper editor, Brian Chambers, a tour of the Buxton coal camp area. Although Brian had written various stories regarding coal mining, he wasn’t certain of the exact location of much of Buxton in northern Monroe County. After touring what once was Buxton with me, Brian commented that he had driven through the area frequently; yet he didn’t realize that he was driving through what once was Buxton, the coal mining camp. 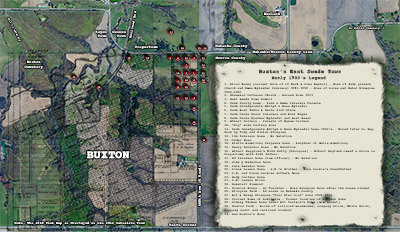 I generated the www.buxtoniowa.com website for those interested in more information, including maps, of Monroe Counties coal mining history and especially how it pertains to my families history. out houses that once populated the Buxton landscape. 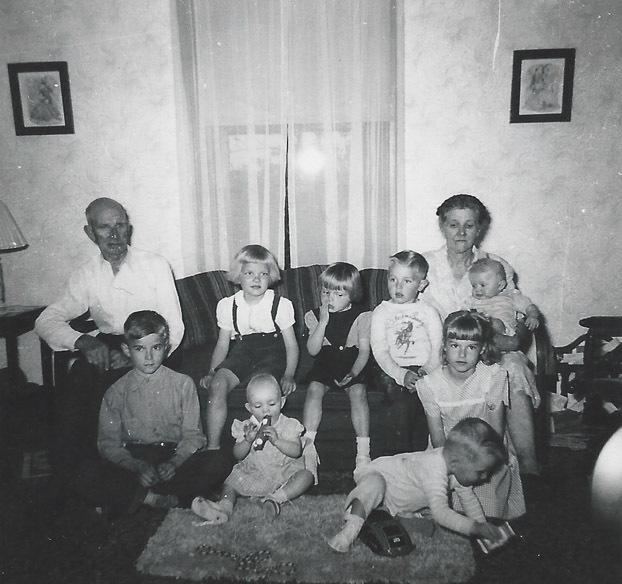 With each passing year, East Swede Town’s Bloom home, my grandparent’s home from 1947 to 1959, becomes a more distant memory, yet a more fond one. I am thankful that the Bloom home has been preserved by Matt and Lisa Keeton. Lisa represents the fifth generation of Larsons to farm the land that was once home to one of the largest coal mining operations, of it’s time, in the United States. One of my cherished moments, when I visit the Keeton’s at the former Bloom home each year, is when Mark gives me tomatoes that he has grown in what was once my grandma’s garden. During my many visits from my home in Minneapolis to Monroe County and its deserted coal mining camp sites, I relish standing alone at various sites and imagine a time when life was a struggle for my ancestors and for the other miners’ families. I imagine being with them and cherishing time with them by recalling events in their lives in the coal mining camps of Monroe County, Iowa. The Charley Bloom home, sitting alone for nearly a century, reminds me of that era long ago. For many with historical knowledge of Buxton, the house is still the “Charley Bloom” home, but for me and my family it was and still remains, “Grandpa and Grandma’s”.